Content is King, hurray. But now what? Which type of content should you produce or have produced? Is it news or are it blog-posts? What about White papers or podcasts? We all wonder which type of content is best to use to convince your potential customer to buy from you. The Content Marketing Institute did some research to find the answer to that question. 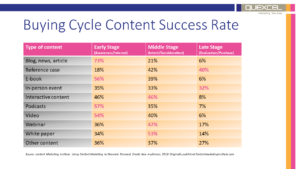 Research shows that in the early stage in the buyers journey it is best to use blogs, news and articles, alongside E-books, Podcasts and Video. At itself that is not strange, because these types of content are mostly used to tell about a new product or solution. In a product video you can show how a product works. In a podcast users can tell their experiences. And in articles or blogs you can advocate your solution. When we look at the middle stage where potential customers consider to buy a product or solution and if it should be your solution, the research shows that interactive content, webinars and white papers work best. Again, no rocket science here. These types of content are most suitable for deeper knowledge on a solution or product. At the moment your potential customer has decided to buy but is evaluating you as their partner you better use customer success stories (reference cases) and in-person events to convince them. Especially the story of other customers already using the product is interesting. Not because you sold it, but the reference customer better tell their story. What was their problem, headache or excitement? What did they consider a solution and how did they search. What are the benefits of the solution or how does it ‘remove their headache’. And, oh, yes, how did you help them. As you can see, there are different types of content which work best in each stage of the buying cycle. Where ‘best’ means: ‘Was this type of content able to move a potential customer from one stage in their buying journey to the next?’. Might you want to know more about content or are you looking for a helping hand with your content creation? Please talk to one of our content specialist. They are here to help you.